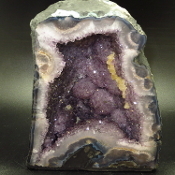 This Amethyst Cathedral stands 9 3/8 inches tall and measures 6 5/8 inches across the base. Shipping and handling in the continental USA is included in price. This Amethyst Cathedral weighs over 18 Lbs. It stands 11 1/2 inches tall. The base is 7 3/8 inches wide. Shipping and handling in the continental USA is included in price. The Amethyst Cathedral measures 15 inches tall and 8 inches wide. Shipping and handling in the continental USA is included in price. This Amethyst Cathedral weighs over 7.5 Lbs. It stands 9 3/8 inches tall. The base is 6 1/2 inches wide. Shipping and handling in the continental USA is included in price. This Amethyst Cathedral measures 13 inches tall and 10 inches wide. Shipping and handling in the continental USA is included in price. 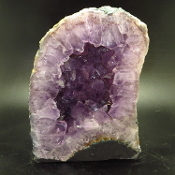 This Amethyst Cathedral stands 18 3/8 inches tall and measures 9 inches across the base. Shipping and handling in the continental USA is included in price. 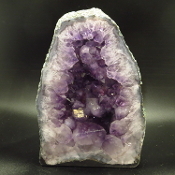 This Amethyst Cathedral stands 11 3/8 inches tall and measures 9 5/8 inches across the base. Shipping and handling in the continental USA is included in price. This Amethyst Cathedral stands 9 5/8 inches tall and measures 9 inches across the base. Shipping and handling in the continental USA is included in price. This Amethyst Cathedral weighs over 11.5 Lbs. It stands 9 1/2 inches tall. The base is 7 5/8 inches wide. Shipping and handling in the continental USA is included in price. This Amethyst Cathedral stands 16 7/8 inches tall and measures 10 1/4 inches wide at the base.Shipping and handling in the continental USA is included in price. This Amethyst Cathedral stands 9 7/8 inches tall and measures 8 inches across the base. Shipping and handling in the continental USA is included in price. This Amethyst Cathedral stands 10 inches tall and is 14 3/4 inches across at the base. Shipping and handling in the continental USA is included in price. This Amethyst Cathedral weighs over 11 Lbs. It stands 9 inches tall. The base is 6 3/8 inches wide. Shipping and handling in the continental USA is included in price.